What is that in Celsius. Sounds a wee bit nippy! It is forecsst to hit 16F here tonight. That's cold enough for me. Joel, stay warm! Indoors! Hot cocoa, hot apple cider, electric blankets, wool sweater time for you! Yeah it was around 50ºF at the beginning of the week, then it turned "cold" (into the 20's) and then "colder" (3 below zero) within less than 24 hours! The rest of the week was mainly in the 20's, but then it got "coldest" last night and this morning! At least, I hope that's the coldest it's going to be! It ended up warming up to zero today! Wow, that's pretty cold to be remaining like that for a solid week! That's just plain miserable. 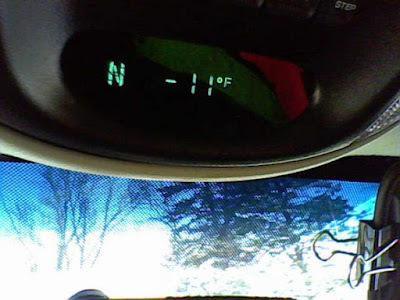 The coldest actual temperature I've been in was a few years back when it got to -31. It didn't stay that cold, but it's quite an experience to be out in it for even five seconds! Joel had a Dream, I had a nightmare. Sorry, I thought it was a speed bump!!! I still can't quite figure out what it is! Ahahahahaha, you guys are not right!